Islay produces not only some of the best but also my favourite single malt Scotch whiskys. Currently home to eight active distilleries (and a further two pending), this island to the west of the Scottish highlands is home to some of the most well known and recognisable whiskys made today. Bowmore, Bruichladdich, Bunnahabhain, Caol Ila, Kilchoman, Lagavulin and Laphroaig provide Ardbeg with some prestigious company producing some of the most intense and characterful whiskys you will find not just in Scotland but anywhere in the world. The label on the bottle proclaims ‘The Ultimate Islay single malt scotch whisky’ which is quite a statement to put on your own bottle but many would agree with its claim. Indeed this highly praised malt was awarded Jim Murray’s 2009 World Whisky of the Year and has a huge following of fans and devotees amongst whisky connoisseurs. The name Uigeadail is Gaelic name meaning ‘dark and mysterious place’ and comes from the loch where Ardbeg draws its water to make this fine whisky. 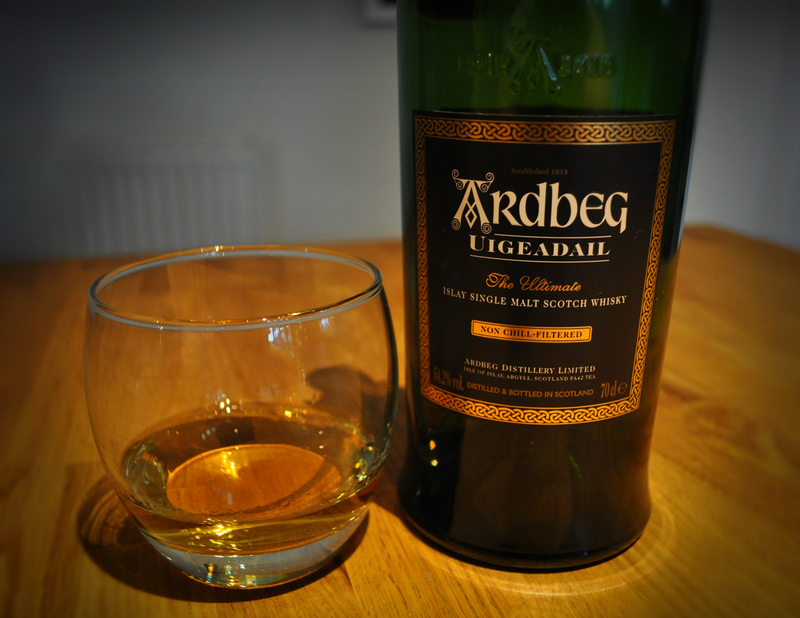 It’s one of several special vattings produced by Ardbeg, but at over £50 a bottle does it live up to the hype? As soon as you open the bottle you can tell that it is peaty but with a gentle smokiness rather than the intense hit you get from a Laphroaig. If you take too deep a sniff your nose will be assaulted with a sharp and burning antiseptic note. There’s an interesting article on the ‘Popular Science‘ blog which explains the reasons that scotch (particularly heavily peated) often has these connotations with seemingly inedible substances and is a fascinating read that fully explains the link. I recommend reading it, after finishing this post of course! A more gentle sniff and a little longer for the whisky to breathe however gives a slightly more gentle aroma of tar and sweetness that’s difficult to identify on the nose but has almost apple like characteristics. Further inhaling of these complex fumes allows you to recognise a subtle treacle note, dried fruits and a specific prune or date like quality, all the time these aromas shrouded in a peaty style so typical of the Islay malts. This bottle is a cask strength whisky, so starting neat with small sips I allow the flavours to build on my palate. Too much and you’ll get a strong sensation of hot alcohol as it hits your throat. Not necessarily unpleasant but overpowering and masking any other tastes. The first and most obvious flavour is a sweetness that no doubt comes from the maturing in Bourbon and Sherry casks. Drinking at cask strength it is a very pleasant and warming experience, but adding a drop of water allows the aromas and flavours to be more easily identified. Further tasting allows me to recognise those dried fruit flavours again, but this time more reminiscent of Christmas pudding and the apple aroma combining with the treacle to conjur up memories of toffee apples. After the sweetness fades there is a lingering salty taste present and an oily quality which coats the palate again with that warming hot alcohol sensation but this time not overpowering, the other flavours still hanging on long after swallowing. Every time you taste it seems slightly different, ever evolving and complex. Is it worth the money? Well that depends what you want from a whisky. I would say Lagavulin is smoother and more refined, Laphroaig is more intense, I’ve tasted richer and more flavourful whiskys from the likes of Dalmore but there is no denying the complexity and intrigue of Ardbeg Uigeadail delivering all of these qualities (albeit, less well than its individual counterparts) in layers waiting to be discovered as you sip and ponder them, each one unlocking the way to the next. At the very least I would recommend you try it if ever you have the chance and if you have more than one opportunity try it again and see what you think second time round!